Almost half of the population of Romania still has no access to clean water. The problem is acute in rural areas. According to an EU-funded initiative known as Connect.Euranet, almost half of Romania's population has no access to clean drinking water. Rural areas are particularly hard hit, as only about 10 percent of villages have a water supply network. But the 11 million Romanians who are hooked up to the public water supply network aren't much better off, since dilapidated water pipes and bad water quality are extremely common. According to Aquatim, Timişoara—the country's third-largest city—has a 637-kilometer water supply network that serves around 330,000 people each day. However, up to 41.5 percent of the water leaked out of pipes in 2012 and disappeared into the ground. Such problems are not limited to Romania. Other countries also suffer from massive problems in this area—Italy, for example. Due to inadequate investment in water supply networks, 30 percent of the country's drinking water is lost before it reaches a water faucet. France loses 26 percent of its water this way, Spain and the UK 22 percent, and Germany 6.8 percent. In view of these figures, the European Union launched a research project known as "ICT Solutions for Efficient Water Resources Management (ICeWater)" in October 2012. The project's partners, including companies such as Siemens and water utilities such as Aquatim and Metropolitana Milanese, are striving to improve water quality and supply. The Siemens team on the project is headed by Dr. Parag Mogre, Project Head in the Global Technology Field Networks and Communication, at Corporate Technology (CT) in Munich and Erlangen. 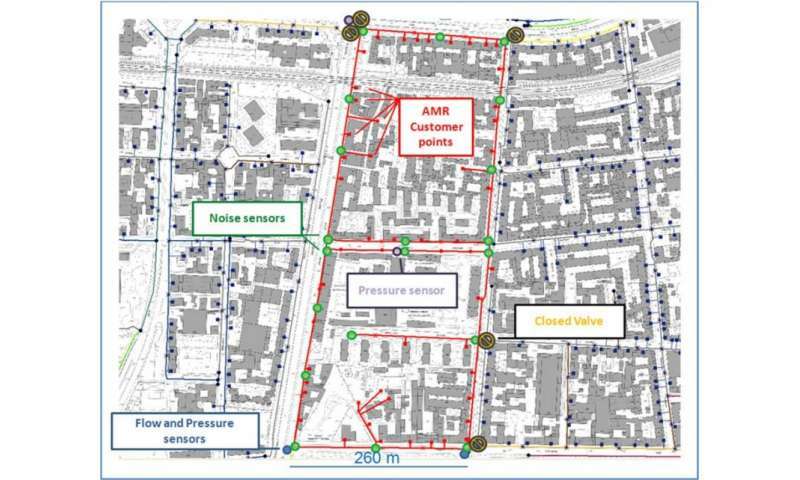 The team has now equipped test stretches in the Timişoara and Milan water supply networks with sensors that measure water flow rate, pressure, conductivity, turbidity, and chlorine content, thus making the networks "intelligent." Sensors mounted on the pipes' inner and outer surfaces use ultrasound and magnetic induction to measure the pressure and flow rate of the water. These measurements allow inspectors to draw conclusions about the condition of the pipes and find leaks. "We also want to install smart meters in residential buildings along the test stretches," says Mogre. "Such meters record a building's water flow rate and generate information that allows utility companies to more accurately plan and ensure the proper supply of water. The results are expected to help participating companies limit water loss when they expand their water supply networks." The data from the sensors in Milan and Timişoara is fed to a SCADA system that monitors and controls technical processes, stores the data and, if desired, transfers it to the online platform—the ICeWater system. This system makes it possible to create a Smart Water Cockpit—an Internet portal that can be accessed by smartphone and tablet PCs. Data transferred from the SCADA system will be abstracted and made available in standardized form. In principle, measurement data could even be delivered in real time—but in order to optimize the volume of information and energy use, it will be posted only on demand. Meanwhile, more than 100 intelligent water meters have been installed in both cities. Pumps too, have been connected. "All these components can now communicate with one another, and can give us important information on the state of a network," says Mogre. To accomplish this, the components make use of languages and protocols that are also used for communication in the Internet. As a result, data from different sensors and systems becomes uniformly accessible. 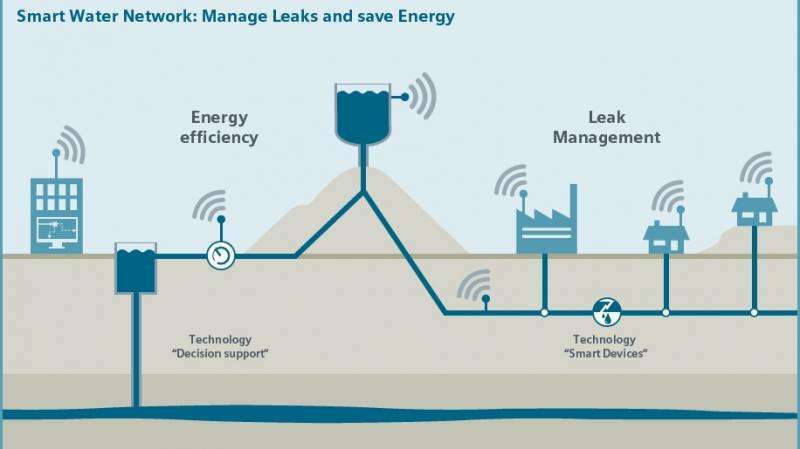 Sensors in the supply network help to curb water loss and to reduce energy consumption. A test area in Milan, Italy that has been equipped with smart water meters as part of the ICeWater project. One new kind of service to be provided by the ICeWater system is a "Demand Forecasting Service," software that uses sensor data to make forecasts about water use with extreme accuracy. The goal of the service is to make it possible to adjust a water network to meet fluctuating demand. In addition, the software will send alarm information and suggestions to the SCADA system about what actions to take, where final decisions are made and where control of the various elements of the water network (for example, pumps) is located. The Smart Water Cockpit could also be set up to notify registered users of alarms. For example, water supply personnel could be notified of an alarm by e-mail, and then get detailed information from the Cockpit's portal. In this way, problems in the water network could be identified and dealt with at an early stage. "Users could also test selected parameters of the water distribution network on this platform," says Mogre. "For example, an individual could call up information on an iPad and simulate changes to the water supply in order to evaluate their effects on energy demand or leakage rates." Milan's water utility company Metropolitana Milanese intends to use this technology to reduce its energy use. Operators at the city's control center will be able to use an iPad to determine how much water households actually use. They can determine which pumps will have to operate when, for how long, and at what output. "This can save substantial amounts of energy. In fact, it will be possible to base entire pump schedules on a location's actual water consumption," explains Mogre. "The special feature in Milan, in particular, is that measuring devices, pumps, systems, and controls from different manufacturers, all of which have been built into the system for years, are now exchanging data with one another and with new components using Web technologies, without having to modify existing systems," he continues. "That would have been extremely difficult to accomplish using earlier methods." How is this going to make governments actually fix/replace underground pipes? This "smart" approach is just adding cost with little benefit.